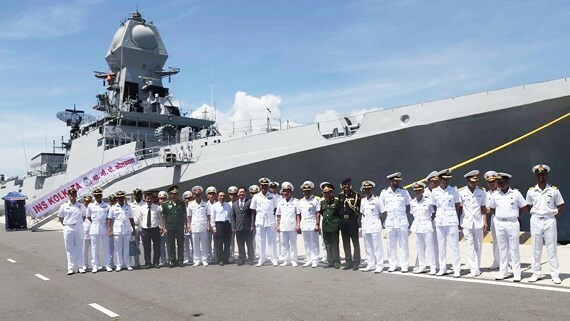 Two ships INS Kolkata and INS Shakti of the Indian Navy carrying more than 730 crew members yesterday anchored at Cam Ranh International Port to begin a four- day friendly visit in Khanh Hoa province. During the journey, the delegation led by Colonel Hara Aditya will participate in a range of sport and professional exchange activities with officers of the Naval Zone 4, and visit Nha Trang city. This trip aims to strengthen the friendship relations between the armed forces and navies of India and Vietnam, contributing to fostering the comprehensive cooperation between the two countries, said Colonel Hara Aditya. INS Kolkata is the latest stealth guided missile destroyer of Indian Navy, with its length of more than 163 meters, a width of 17.7 meters and 7,200- meter stretch of water. The ship was equipped with many modern weapons, radar systems, anti-submarine missiles having abilities of anti-ship, battleship, surveillance and antitoxic. Whereas, INS Shakti is the deepak-class fleet tanker with a length of 175 meters, a width of 25 meters, a loading capacity up 27,500 tons and a maximum speed of 20 nautical miles per hour.